I have intended to seriously do exercise after retirement to keep up the good health. Experience with my mother illness from her last 12 years before deceased prompted me to find type of exercise that suited myself most. My plan is making a trial with Tai Chi exercise at Rama IX park in the early morning. Incidentally, one month before due Miracle Tai Chi has been scheduled weekly at the Office. After the class, I enjoy the exercise tremendously and realize that joining the group at the park is not sufficient. There are much more details to learn about Tai Chi. Starting the lesson in August 2017 and completed Basic Miracle Tai Chi Practice a year later followed by the completion of Basic Miracle Tai Chi Practice Leader, I am attending class on Basic Miracle Tai Chi Instructor. Combining with my meditation practice, I am totally convinced that Tai Chi is the exercise method suitable to myself. It is not only for good health, but also mindfulness. In particular, SHEB system of recording practice routine in the book is the smart way of creating discipline and encouragement. 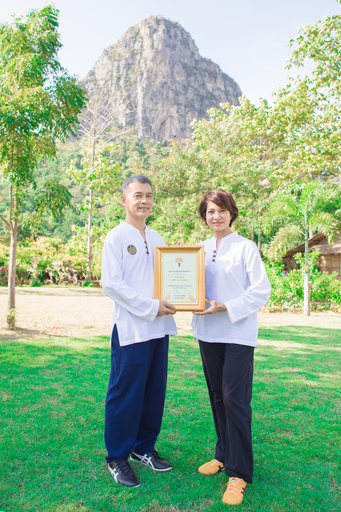 I would like to extend my gratefulness to Ajarn Somsak Inpuek, Founder of Miracle Tai Chi,for his determination and thoughtfulness in setting up this Practice and System. I am thrilled having found Miracle Tai Chi! Finally, I have found useful work to do after retirement – sharing Tai Chi experience with others, for them to find a healthy life! ชื่อบริษัท เอราวัณเพียวไลฟ์ จำกัด Arawan Pure Life Co.Ltd. Swine and Poultry farm owner in Chachoengsao. Have been working on this field for 20 years. Start doing Taichi on August 28th, 2016. 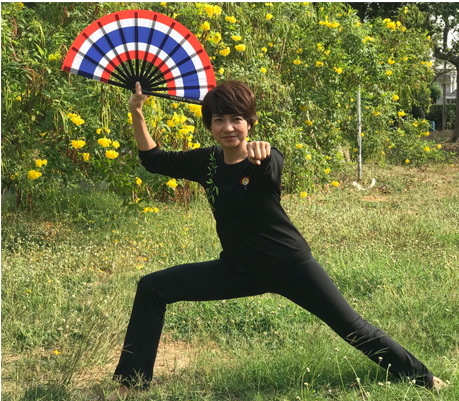 Present: learned 24 posts and taichi using fan. I had received a spine surgery since my early 30s. As a result, I am not able to balance myself as perfectly as before. I have been searching for a form of exercise which could suit my body well. Till one day, one of my friends, introduce me to miracle taichi. I do realize that this kind of exercise is quite somehow different to the others. I have recognized with myself that my muscle strength has been increasing which is because of by doing Taichi. Additionally, I had realized that this also increases my breathing capacity. Every time after doing Taichi, I feel like it’s empowering me, to have my potential to do all my activities all day long. During my early training, responsibility is required. This could be maintained by, thankfully, to the “Notebook” that “ar-jarn” or mentor gave it to me. After practicing for a while, I feel like it is one of my daily routines, I have started to recognize that the notebook showed me how much improvement I had compared to the past. Also, this reflected to me and showed how frequently I have done my practice. The result is I have a better and healthier life. Lots of thanks to Ar-jarn Somsak for creating a training system called SHEB. 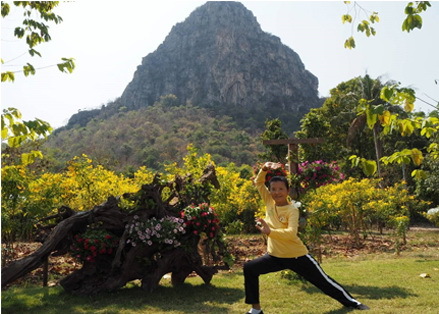 Which create a standard for taichi practicing, a control system, and a step by step evaluation. So, all the trainers are now able to practice by themselves as frequently as they wish to or sometimes do it like a daily routine. 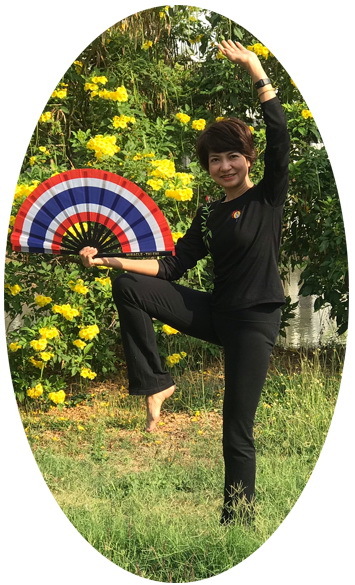 Other than that, Ar-jarn Somsak also customizes the taichi postures accordingly to each person own needs, in order to prevent injury from doing taichi. Ar-jarn Somsak has always told me that Taichi could not be able to cure the piece of metal in my back but, Taichi could be able to make the metal in my back, stay much longer. After viewing myself from the past, if I didn’t decide to start doing Taichi, I have absolutely no idea how worst could my body get to. Or, if I start doing Taichi now instead, will I be able to do as well as myself 2 years ago. The Golden Club โครงการโบนัสแห่งวัย(ททท.) งาน"สุภาพดีเพื่อการท่องเที่ยว.. สัญจร"